As of 2017 justCASES is now in our new location! Local in Colorado? Come Visit Us. justCASES started in 1994 as a spin-off of Tecra Tools. As one of the top providers of professional tool kits, Tecra Tools developed expertise with cases. 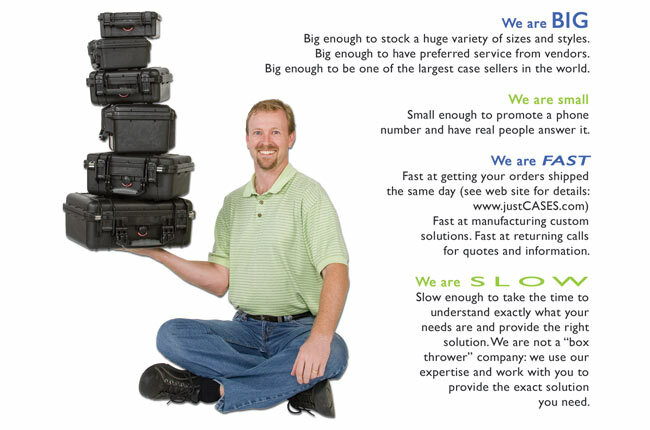 As more and more people requested empty cases for shipping their own equipment and products, we realized the need for a business like justCASES. We accept Visa, Master Card, Discover or American Express. You may also send check or money order. There is a $35.00 international wire transfer fee. Accounts are available on request to highly rated firms, government agencies, recognized schools, national institutions, hospitals, and medical centers. To open an account, send commercial and bank references. Our terms are Net 30 Days. Appropriate trade discounts have been deducted. For quantity discounts call for our latest quotation. We reserve the right to change prices without notice. All prices are net in U.S. Dollars. Pricing Discrepancies: Any discrepancies will defer to order pricing. justCASES.com cannot be held responsible for errors or omissions in the content of this site, or in our printed material. Compensation and adjustments, if any, for any error or omission is at the sole discretion of justCASES.com. Taxes: justCASES.com reserves the right to add any and all applicable taxes as required by law. Companies wishing to gain tax exempt status must provide copies of required documentation and licenses before orders will be shipped. Except for oversize items and special requests, justCASES.com ships via United Parcel Service. On open accounts the shipping charge will be pre-paid and added to your invoice. The shipping and handling charges will vary according to the weight, insurance and destination of the package shipped. � KEEP the cardboard packaging. � Contact us within five days. � Customer is responsible for all shipping costs. � You must contact us BEFORE returning any products. � Returns must happen within ten days of receipt. � Case must be returned in original shipping box. � Returns may be subject to a 15% restocking fee. � Case must be in new condition. � Foam must be in new condition. If the foam is altered or damaged, the cost of the foam will be deducted. � Custom cases are not returnable. Please call 888-318-5878 for any repair authorizations you may need. We can frequently ship replacement parts like wheels and handles quickly. On many cases these are extremely easy to replace. All repairs must be arranged prior to shipping any product (customer is responsible for all return shipping costs). Do not return any goods without prior authorization. We will gladly ship to an APO/ FPO address. These orders must go via US Mail, and the shipping amount may be different than displayed on your web order. We will contact you with final shipping price. We can not track any packages sent via US Mail, or packages being forwarded by Military Mail. � We will calculate shipping prices and options and contact you regarding wire transfer information. � We do NOT accept international credit cards. We DO accept wire transfers, with a $35 transfer fee. � justCASES is not responsible for tariffs, taxes, duties or other customs charges. � We do not accept returns or exchanges on international orders. justCASES.com cannot be held responsible for errors or omissions in the content of this site. Compensation, if any, for any error or omission is at the sole discretion of justCASES.com. The customer shall determine suitability of cases and foam requirements for their intended application and assume all risk and liability. JustCASES.com and the manufacturers' only obligation shall be to replace such quantity of the products proved to be defective.